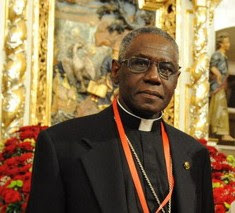 Cardinal Robert Sarah, 70, of Guinea, is the prefect of the Congregation for Divine Worship and the Discipline of the Sacraments. Cardinal Sarah makes it clear for every Catholic with regard to the discipline of receiving the Holy Eucharist. If one is unrepentant about one's lifestyle which by the church's teaching authority is gravely sinful then one cannot receive the Holy Eucharist. “The entire Church has always firmly held that one may not receive communion with the knowledge of being in a state of mortal sin, a principle recalled as definitive by John Paul II in his 2003 encyclical ‘Ecclesia de Eucharistia,’” on the basis of what was decreed by the Council of Trent." Cardinal Sarah is a phenomenal man. I have been reading an extended interview with him in the book "God or nothing" and so far every time I read more about him my estimation of him grows. I highly recommend the book.